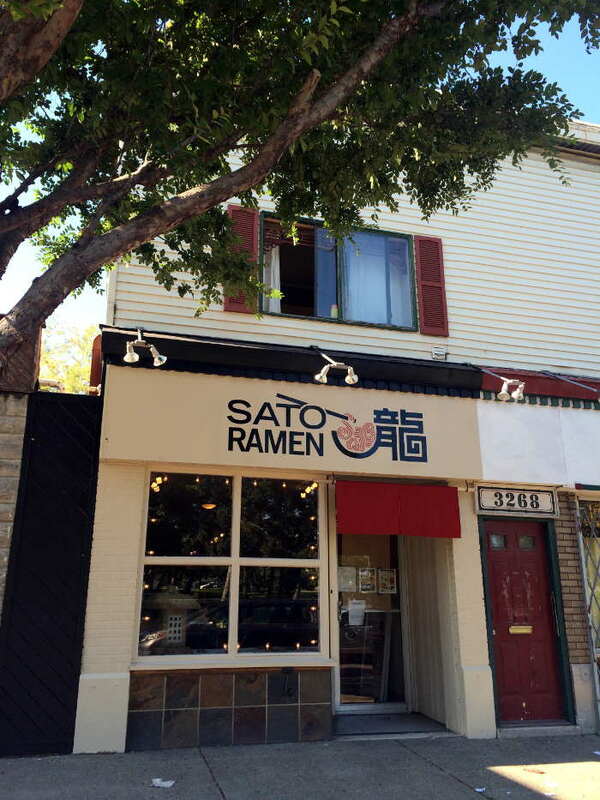 SATO Ramen on Main Street in University Heights is the sister restaurant to SATO in the Elmwood Village. 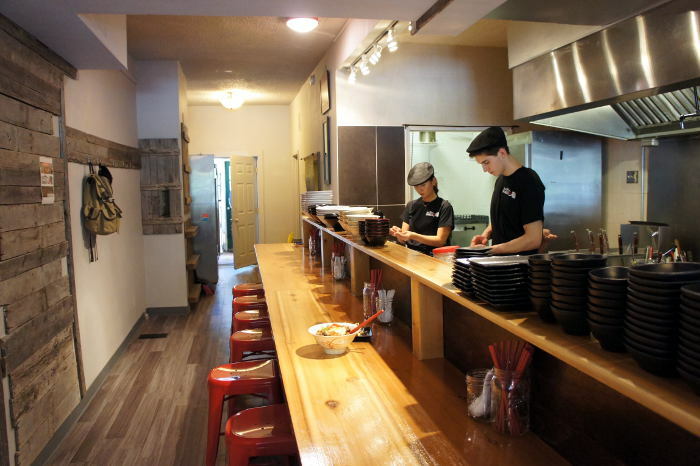 Owners Josh and Chef Satomi Smith opened SATO on Elmwood in February of 2013 as one of the only places in Western New York serving Japanese favorite, ramen, alongside other modern Japanese cuisine and sake. 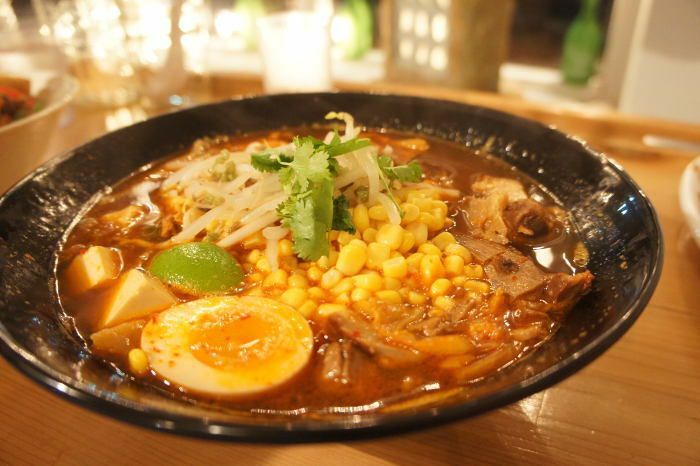 Since then they’ve expanded in some pretty exciting ways, filling a culinary gap Buffalo experienced for years, learning to produce their own noodles in-house and making their dream of a casual, blue collar ramen bar a reality. Hoping to slurp a big bowl of flavorful ramen or on a quest to experience the wonderful world of Japanese food? 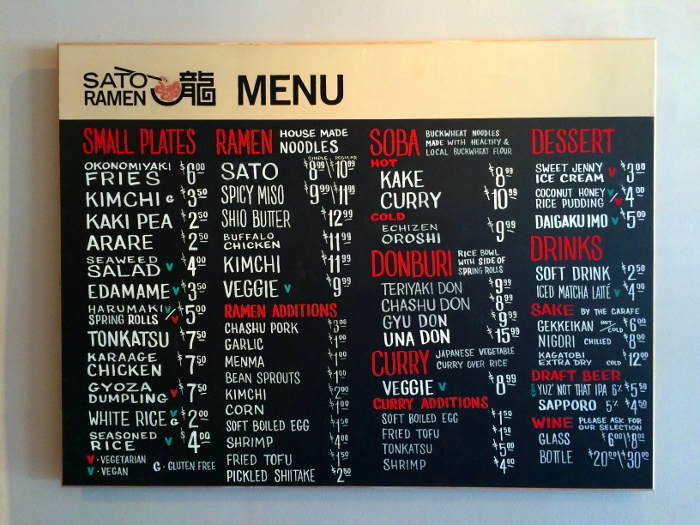 We highly recommend a visit (or two, or three) to SATO Ramen. The food and space are fit for so many different kinds of people – students, professors, collars of all colors, families, Millennials, empty nesters… you name it, you’ll fit in. 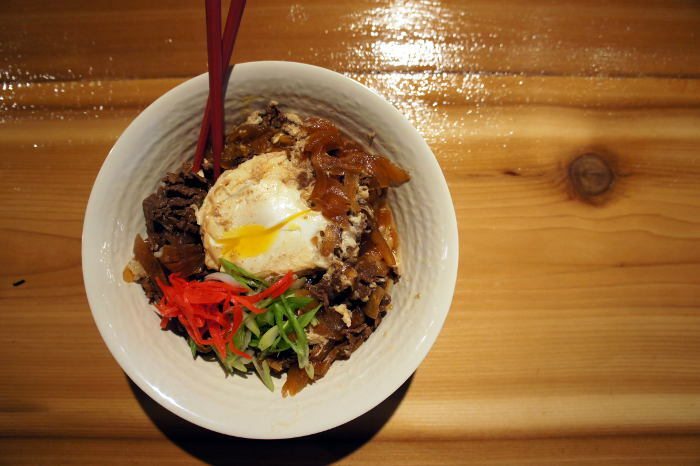 While SATO Ramen does offer table service, be prepared to scooch over and share your table. The place gets busy, and there are only so many seats in the narrow space – adding to the charm of course. Service is casual, so come as you are and enjoy the process. Considering that this is a ramen bar in a small space with a pretty small kitchen, the menu is quite large – quite delicious too. 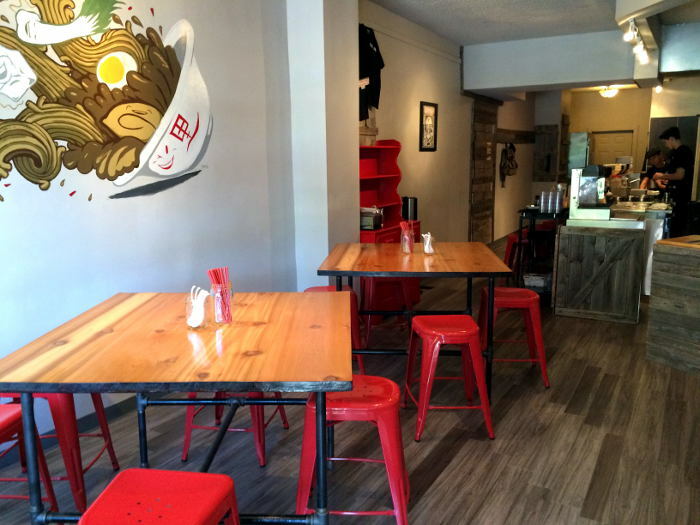 They have several small plates to share like SATO Made Kimchi, Kaki Pea, Seaweed Salad, Harumaki Spring Rolls, and Karaage Chicken, some of which can be found at their Elmwood location, some new to the ramen bar. The rest of the menu is broken up into sections featuring Ramen (homemade noodles served in scratch soup stock), Soba Noodles (noodle bowls with soba buckwheat noodles made in house using local buckwheat flour), and Donburi (rice bowls served with a side of spring rolls). You’ll also find Japanese Curry and a few desserts on the menu. 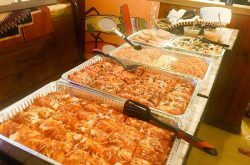 They’ve got plenty of vegetarian, vegan and gluten free options as well. While these guys know what they’re doing in terms of Japanese tradition, they aren’t afraid to venture out into the unknown and test the limits with unique interpretations. Buffalo Chicken Ramen, we’re looking at you. 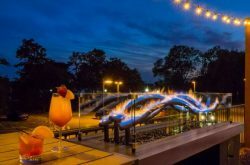 Beverage options are wine by the glass or the bottle, and draft beer including a Japanese Rice Lager and a SATO signature collaboration with local brewery Community Beer Works called Yuz’ Not That IPA. You’ll also find a few Sake options and non-alcoholic bevys too, of course. We visited on a cold/rainy night (clearly this was NOT in December 2015) and arrived to a full house. Luckily, we were welcomed by existing patrons who shimmied around to make room at the window counter where we fit perfectly, albeit snugly. This happened repeatedly during our stay. None of the diners seemed to care, which was great to see. 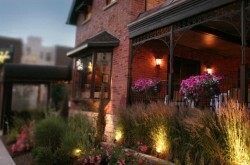 Our service throughout the evening was casual, friendly, attentive and accommodating. Fair warning, be prepared to wait. If I were to bet, I’d say all the shimmying in the world won’t get you a seat right away most nights. Don’t worry, it’ll be worth it. Okonomiyaki Fries, small $4.50, large $7 . . . . Okonomiyaki is a famous street dish from Osaka, so we’ve taken this and put a poutine spin on it. Hand-cut french fries with okonomiyaki sauce and Kewpie mayonnaise, bonito flakes, nori, green onions and pickled ginger. I’ve never had anything like these before in my life. 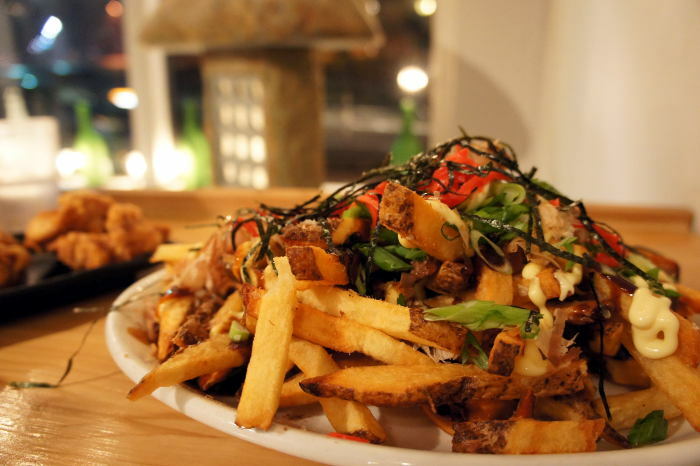 A mountain of perfectly cooked fries piled high with Japanese flavor. 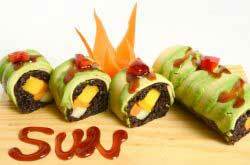 From the sauce to the nori to the pickled ginger, these are interesting and delicious. Eating them is like going on an Asian flavor journey. Crispy and seasoned on the outside, warm dark meat on the inside. 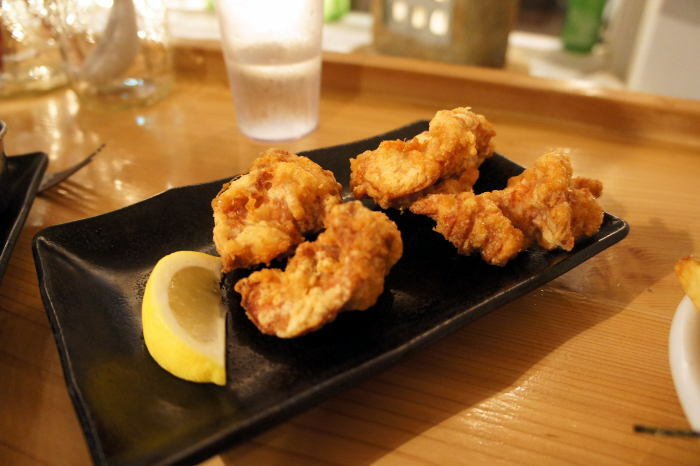 Karaage refers to a Japanese cooking technique in which the small pieces of chicken are usually fried in a light oil after being coated in a mix of Asian seasonings like soy sauce, garlic, or ginger along with a seasoned flour. Similar to Southern Fried Chicken, but then again not very similar at all. These, along with the Karaage Chicken, can also be found at the Elmwood location. Six delicious pork (that’s what we got) dumplings that hit the spot. Maybe a little pricey for a half dozen, but good nonetheless. A more refined version of Ramen than we are used to. 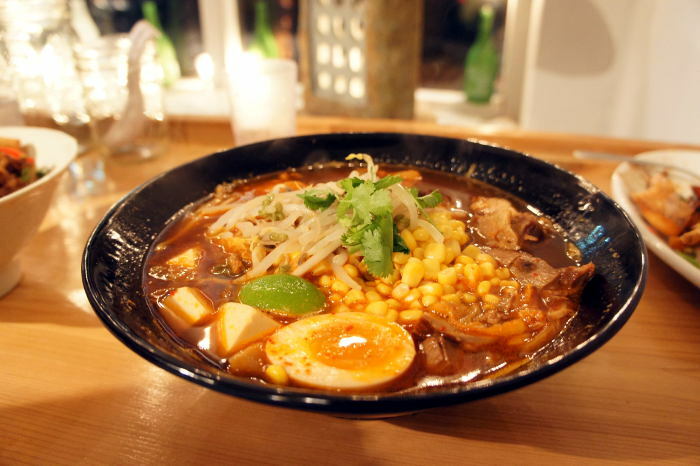 The flavors and textures are lighter than the other ramen dishes. 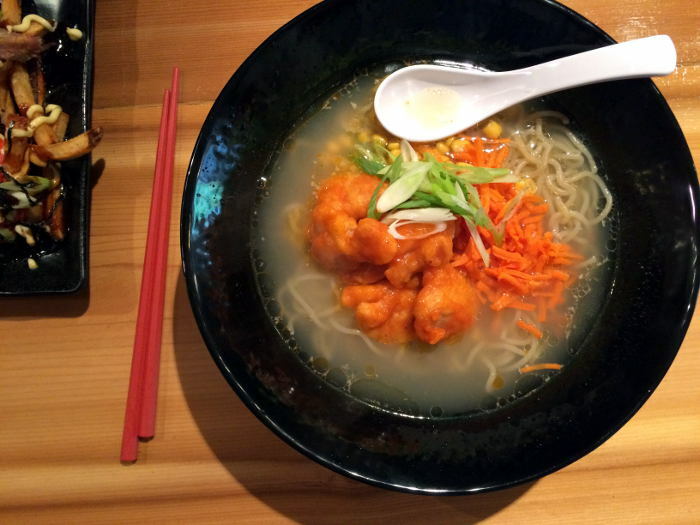 The shrimp adds a subtle seafood flavor, complimenting the buttery nature of the broth. Definitely a less spicy, lighter ramen option. Note: They have tons of ramen additions to add to your bowl for $1-$4 more like Chashu Pork, Kimchi, Pickled Shiitake, and Fried Tofu for example. This hearty rice bowl is packed with meat flavor. Perfect for a cold night when in need of some comfort food. The contrast of refreshing pickled ginger and warm beefy rice was fantastic and the dish stood up next to the ramen just fine. Nobody puts rice bowls in a corner. For more info on SATO Ramen, visit their website and follow them on Facebook, Instagram and Twitter.